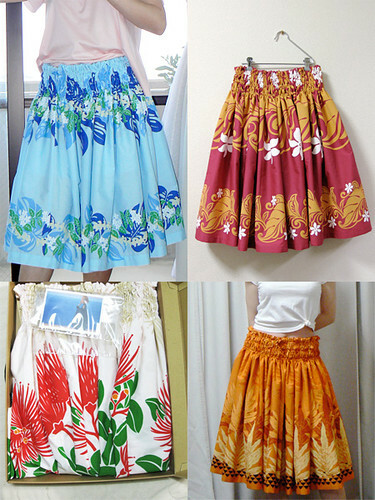 Since I bought my Bernina, I've been sewing Pa'u skirts for my mother. So, instead of making her new skirt with the enthusiastically elastic inserted waist band, I gave her a tiny birthday present that she requested, and made this tiered skirt for compensating my now-meaningless passion. I can't dance, I only wiggle, so I just needed a small amount of gather and bulk in my skirt, but I hope you can see my inspiration from Pa'u skirts in it. I used 1m of white linen for it. 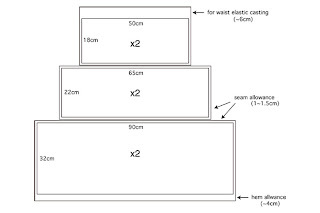 (Each of her Pa'u skirts was made from exact 4yards=3.6576m of cotton/polyester.) Yes, I tell you that linen fabrics crease very easily as you can see. However, thanks to the gathers everywhere, creases in this skirt didn't bother me much after a long day. I actually like this fabric very much, it flows kinda elegantly in a maximum way of being a casual fabric. 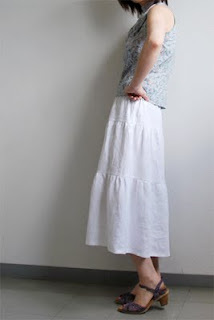 The skirt has got three rows of elastic castings at waist, and it sits very softly and comfortably on my tummy. 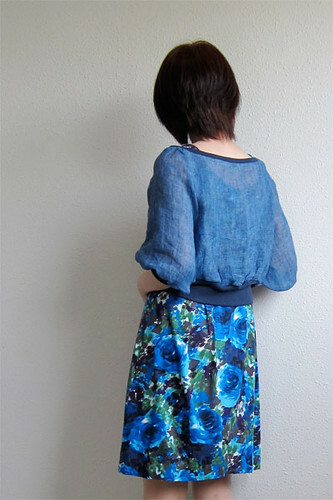 This will be a lovely weekend skirt for staying-in at home. By the way, I didn't use any pattern for this casual skirt, but cut the fabric in 6 pieces of rectangles and sewed them together. I made a diagram of my pieces, for your reference, in case you'd like to make similar one for you. Coral is the name of this blouse. Correctly, it's the name of the pattern for this blouse. size38(JP9). Symmetric use of the left sleeve to both sleeves. Lettuce edge execution for sleeve hem. 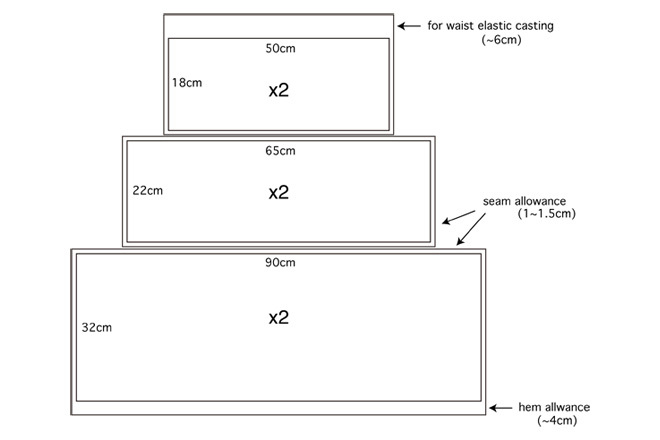 Overlock binding at hem and neckline. fabric: Polyester georgette, light, thin, sheer, off-white, flowery pattern. Cotton/polyester jersey, light and smooth, T shirt-weight, pastel pink, stretches well, for hem and neck band. I think I need to make another one with asymmetric sleeves, too. This is a fun pattern, which makes feminine summery blouses. You can also read the post for the red pants here. 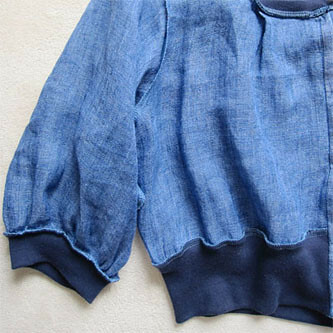 I've got a small piece of indigo linen gauze, and I couldn't think anything but making it into a cardigan blouse. I imagined it would make a very nice casual and feminine light jacket-like cardigan blouse (sorry for my wobbly English!). 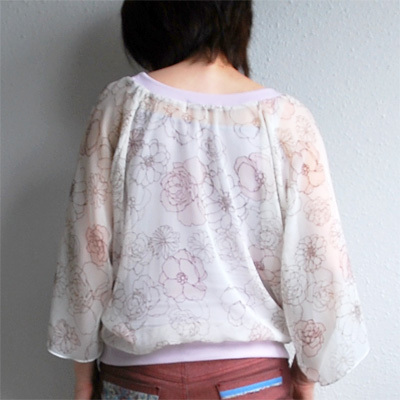 The most recommended fabric for the pattern I used was light jersey, but my fabric was a thin and coarse linen gauze. It resulted a pair of air-filled sheer sleeves, as I wished. This time to assemble, I combined the jersey waist band and the woven bodice by overlocking together. Like we do all the time to the combination of jersey waist band and jersey bodice. However, I've learnt that I'd better to baste my woven bodice to make it slightly gathered before attaching to the jersey waist band, instead of simply binding them together. Otherwise, I'd get my soft waist band too stretched and the least neat gathering on the bodice, like I did. I think it looks a bit untidy in the end, because I have chosen the wrong strategy on my coarse gauze. Experience is the best and real teacher, indeed. Photo below: The sleeves were basted to make gathers before serging, but the bodice was bound to the waist band straight away. You see the difference, don't you. Maybe I'll fix it, but maybe not. You know what I mean. That said, I'm loving this blouse overall and so much. I'm sure I will use it very often. I'll also try the pattern again, with a bit of wisdom which I didn't have! size38. Shortened the bodice by 5cm. 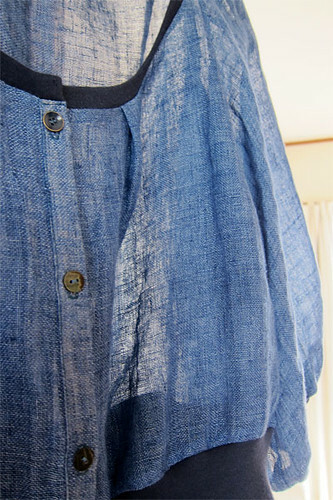 fabric: Linen gauze, thin, light, coarse, indigo. Cotton jersey, soft and smooth, stretches well, good T shirt weight, dark blue. The jersey dress was one of my last summer's creations. P.P.S. There is something wrong going on with my DISQUS at this moment at least in my environment. If you would like to leave a comment but don't find the comment column anywhere in the front page, please click "the updated time" or "title of the post" to follow the link to the individual post page and you will see the comment column at the bottom. I'll sort out this problem ASAP. Sorry for this inconvenience.